Indian Cinema Lets Users Tap to Launch Mobile Services | NFC Times – Near Field Communication and all contactless technology. About 200 users tapped NFC tags in smart posters and other displays at a movie house in Mumbai as part of the first phase of a campaign implemented by Indian startup jusTap! More than 200 users tapped tags in smart posters and other displays at a movie theater in Mumbai, India, and about a third of them downloaded the cinema chain’s app over a six-week period, according to the wireless marketing company that ran the campaign. 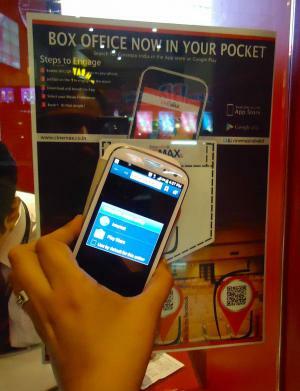 The campaign, “Box Office Now in Your Pocket,” features NFC-enabled smart posters and self-standing cardboard displays, called standees, at the Cinemax chain’s flagship location in Mumbai. The posters and displays also sport QR codes. JusTap!, the startup implementing the tag campaign for Cinemax, said more than 200 users had tapped the tags over the six-week period studied, without any promotion or ushers directing patrons to the tags. The company said 35% of users who tapped the tags downloaded the Cinemax Mobile App, 26% left feedback for Cinemax, 20% “liked” Cinemax on Facebook and 19% purchased movie tickets from their smartphones. Article has about 260 words.